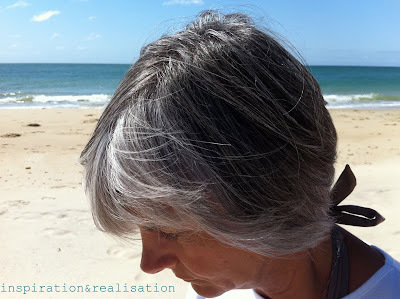 inspiration and realisation: DIY fashion blog: to grey or not to grey? 8 years ago (day less, day more), I took a decision that I was pondering for a really long time. ... Stop dyeing my hair and let it go grey. mmmhh. Not an easy decision. I was always attracted by women not yet very old, proudly showing their grey hair. But when I had my first greys... I covered them up. I started quite young, but got into the dyeing routine every 3-4 weeks when I was 30 +/-. After so many years I was thinking to go grey, but wasn't sure, then I couldn't handle the (literally) 'grey area' between brunette, brunette with lots of roots and grey. Finally, decision. I would do it! 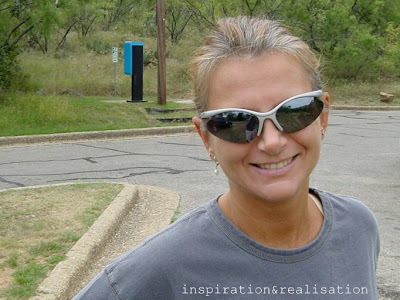 I spent probably more than a month in a pony tail! My hairdresser was pushing me into this direction (he's a good hairdresser, not very good if you look from the marketing point of view!!) saying that I had the right features to look good in it. Well, if you're leaning toward this direction, I can tell you few things that I love and hate about going grey. 1- No dye. Means no chemical, and your hair gets stronger-er-er. 2- No roots. No needs to comment! 3- Time saving. Whether you are a diy dyer or a hairdresser one, you don't have to do it. Considering 45 minutes if diy or 1.5 hr if you go to the hairdresser every 3 to 4 weeks, you'll have at least 9 extra hours/year to do other things than dyeing your hair. 4- Money saving. A lot. Again... need to comment? 5- When I'm tan, or with make up on I LOVE the look, it's so stylish and sophisticated. 3- You'll be asked why. But I do hate other kind of stupid questions not hair related that people ask. 4- Some change in color choices in clothing. But again, we all look better in one color than another. I can't really think of anything else, overall, I passed the "7 years itch" and still love my grey hair. I changed different styles, and length, and so far in my case, short works better. 1- In my opinion, the best and fast way to go grey: once your roots are let's say 1" long... get a short haircut and you've done with the past! 4- At the time, I tried to camouflage the roots for a while with some coloring shampoo. White hair absorbs much more color, and this technique didn't work for me. Even if the shampoo isn't permanent, the white hair will turn yellow-ish and as a result, made my process of going grey a little longer. If you're trying to make up your mind and take a decision, I hope this was enlightening and helpful! Are you pondering the idea of grey? I've always thought grey and white and that lovely shade of peppery color were gorgeous. I've got one or two little grey hairs now and honestly I think that by the time I have a headful of them, I'll still be just as happy with my hair as I am now. thank you thank you thank you! I have been pondering this for a long time. I have long hair and the thought of going short is a bit scary. Still pondering, but getting closer to being natural. There are days I am ready - then there are days I am not. You have beautiful silvers! I have a curly texture which makes it harder. Someday I will be posting that I did this too. i started to become grey in my early twenties, but i didn't do anything about it. It was not that much. But then i decided to color my hear with henna, just for fun. That was my start of hairpainting ... Not because of the grey, but because it is not easy to stop doing that without cutting it. And I really don't want to cut it ! I love it! I have never covered my grey, I don't know that I will - but I think that the grey on you does NOT make you look older, it does work with you perfectly!! I'm only 26 and I have grey, so I'll wait a bit longer to stop covering them up--but good for you! Good for you! You look fabulous in those pictures! I must admit I'm still at the colouring stage! LOVE GREY! I was grey early in life. Had a shock in front bang full @ 25. NEVER coloured my hair. But then around 35 I began to colour again- grey too uneven. Now, with a two year old and being 41 I colour fully, all the time. People assume I am alot younger than I am. And I don't want to look like his grandma ;). I'm 47 and have been considering letting my grey go for quite some time. I have coarse, curly/wavy hair and I found out recently short cuts don't work for me. I'm currently growing it out but thinking maybe now is the time to finally do it! You look great. You suit the grey. Wear it proudly. I fought the good fight for many years and finally learnt to love my salt and pepper hair. It's not how old you look but how young you feel. On my 33rd birthday I decided to no longer dye my hair. I have almost jet black hair that I had been coloring for over 12 years. Everyone except my husband was NOT supportive. And my husband was the only opinion that mattered. I would say I'm 20-25% grey at this point in my life. It took me a good year to go completely natural, and I would give nothing for it today. All the nay-sayers now love my natural black and grey hair. I am now 35 and I love my hair. It was definitely an adjustment but all the pros and cons above describe my experience completely! So glad to hear someone else was willing to jump too! GOOD JOB! So how old are you?. I'm 35 and I started going gray at 16. I'm probably about 25% gray now which really shows against my dark brown hair. I've been getting it touched up for about 5 years now but I've thinking about switching to highlights to help it blend in better. I remember my high school librarian. She was completely gray and I assumed she was in her 50's. One day she came to school with really dark hair. It looked so alien on her. It turns out she was only 38. I don't want people thinking I'm 50. But then the other day I saw a mom with her kids. She was probably about 35-40 and completely gray. She was adorable! In the end I think you are very brave. You're so beautiful. I don't have any problem with my age (will be 40 in September) but for some reason I am not ready to do this. I have lots of grey and am having to color almost every two weeks (hate it!). Looks awesome on you! I think you look fabulous in grey! :) I wouldn't even know how much grey hair I have yet - I have been dyeing it blonde for so long now, I think I will just continue to do that. Not because I'm scared to see how grey my hair might be, just because I think it looks better than my natural hair color.. I have been grey since my 20s and I am now 39. I have had short periods of "going grey" - during my pregnancies, and a couple of other times because I was sick of dying my hair every six weeks. Now I have a short waif cut (all grey/white/salt&pepper) and I feel positive about it all until someone makes a comment and thinks I am my childrens' grandmother. My children are aged 4 and 8. Being overweight doesn't help either. So still dithering (mentally) about the whole thing. I'm loving my greys! I'm 35 and have not dyed for over 2 years. I'm never going back! You good-looking grey-haired women are so lucky. I tried it for two or three years in my 40s and was close to having an intervention done on me by family and friends. It really looked horrible. I had a lot of black mixed in and it did not suit my skin color. Black has always washed me out and made me look ill. I did find a pretty good safer hair color to use so at least I've got that. I might try it again as I'm sure I have a lot more grey 10 years later and maybe it won't look so bad. I totally support this in others, wish it had worked for me! It's cool as f- to see a younger woman go natural.. It's very beautiful.. We get so obssessed with our youth we've lost our own sactity at just being a nice person.. Lots of younger women are showing today.. It's only about fifty years later..